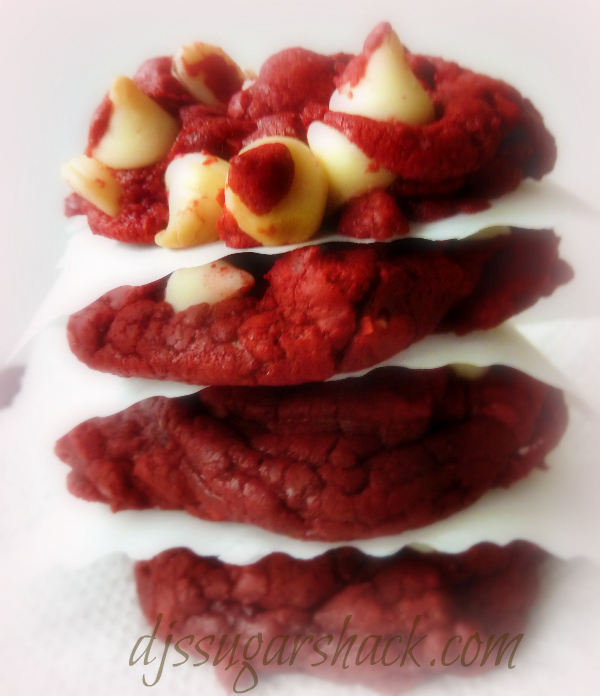 Somehow, I totally forgot about these Red Velvet Chocolate Chip Cookies that I shared over at Pamela’s Heavenly Treats months ago. The recipe uses a box cake mix so they are a quick and fool proof recipe. Although most of my baking is done from scratch, I believe that we all need a few “cheater” recipes for those days when you need to make a treat in a time crunch or maybe your just feeling lazy & don’t want to clean a bunch of dishes. Who knows, maybe you waited until the last minute to start your holiday baking. Whatever the reason may be you, need to make these cookies. They are just as delicious as they are pretty. At any given time time you can find Red Velvet cake mix and White Chocolate chips in my pantry for the soul purpose of making these cookies. Stir the cake mix, eggs and oil until combined. Using a cookie scoop or large spoon drop dough onto baking sheets.